The majestic Alps were often on my mind as an ultimate travel destination. However, unlike our many friends, my husband Alex and I never took up skiing or hiking. So, when considering an Alpine resort for our Spring 2015 trip to Switzerland, we first thought: Oh, my, all this money for just staying in an expensive hotel, drinking overpriced hot chocolate, and watching young people skiing…Then we thought: “Heck, why not? I am glad we did. The two days and two nights we spent in the Swiss Alps was a time of absolute enjoyment. 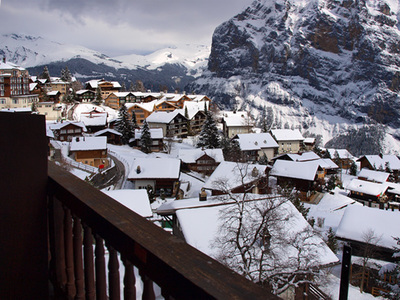 We picked the village of Murren in the Bernese Oberland located on the border of Bern and Valais cantons. The road to Murren included changing several trains, a short bus ride, and finally a slow ascent in a cable car. Exiting the station, we were standing in front of our hotel, the most charming chalet adorned with fairy-tale gables with gingerbread-style trim. Hotel Alpenruh is spectacularly perched over the Lauterbrunnen valley facing the mountains of Jungfrau, Eiger, and Monch. The hotel general manager met us like his old friends. Our room was simple and spacious and had all the amenities. The view from our room balcony was simply breathtaking: the mountains were close and personal. 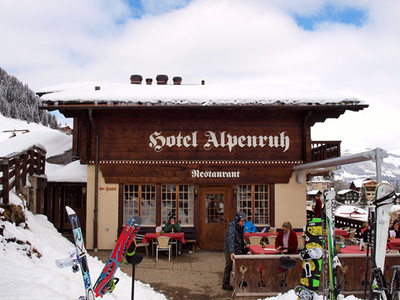 The Alpenruh panorama restaurant with magnificent view served excellent local dishes, like rosti and fondue. 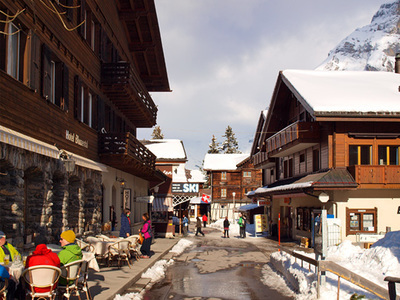 Murren is a popular ski resort, but it did not feel like an overcrowded tourist destination. Even with every table occupied on restaurant terraces, it still was timeless, quiet, peaceful, and romantic. 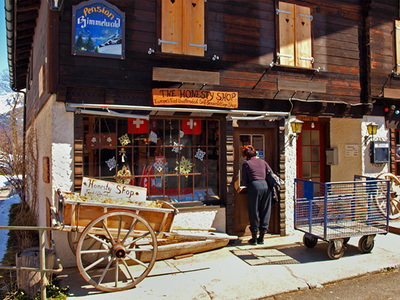 Murren does have a state-of-the-art sport center, yoga studios, discos, and bars, but if you want to see it as an old Swiss village, this is how Murren will present itself. Allmendhubel – the SKYLINE CHILL. We took a 1912 funicular from Murren to Allmendhubel, a picturesque spot that, at a 6,256-foot elevation, offers a beautiful view of the surrounding mountain peaks. A short trip there allowed us to combine an exciting funicular ride, grand views of my friend Jungfrau, and a perfect cappuccino served on the cozy sun-lit terrace of the Allmendhubel restaurant. 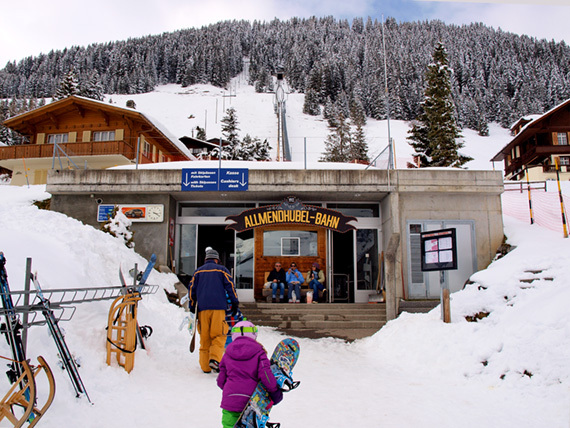 In addition to skiers, snowboarders, and sledders, this is a perfect destination for walkers and families with children. Hikers of every age were coming and going, sharing their exciting impressions. Allmendhubel’s Flower Trail is well suited for all ages and levels of athletic abilities. This twenty-minute walking loop offers great mountain views year-round and some 150 types of alpine flowers in the summer. In July, the Schilthorn Company co-sponsors the Lilibiggs Children’s Festival packed with activities and offers a large camping area. 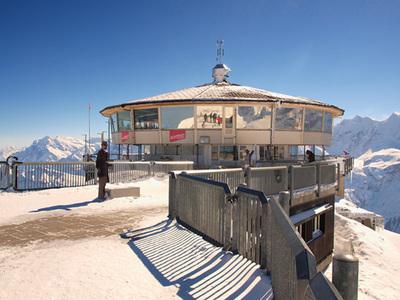 Schilthorn: the SKYLINE VIEW. On our second day in Murren, we went to the summit whose name graces the cable car company: Schilthorn. We took the Schilthorn cable car that smoothly and effortlessly carried us first to Birg and, after a quick change of cars, to the almost 10,000-foot high summit of Schilthorn. The journey was a true visual treat. The car, suspended between the bright blue sky and sparkling white mountains, glided through the air, past frozen waterfalls and sheer rock faces, to the Piz Gloria station. 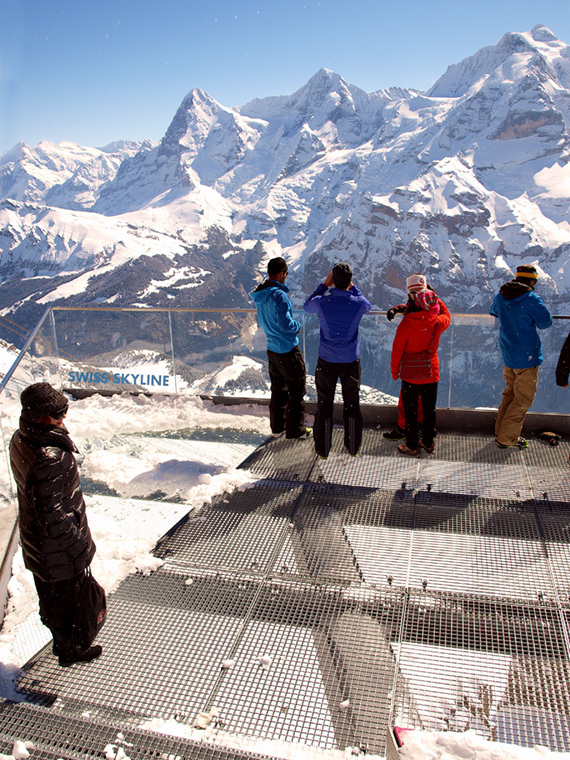 The view from the Piz Gloria panoramic platform was astounding. I could stay there forever and contemplate the magnificent Alps, but we could not afford to miss the famous breakfast at the Piz Gloria rotating restaurant. In 1967, due to financial difficulties the construction of the Schilthorn aerial line had to stop with no relief in sight. 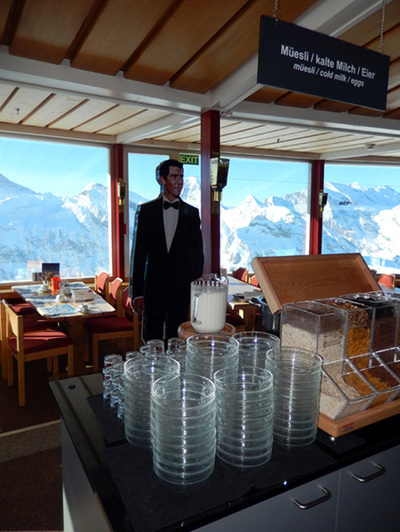 Luckily, the production manager of the new James Bond movie, “On Her Majesty’s Secret Service,” came upon the unfinished revolving restaurant at Schilthorn and fell in love with the panoramic scenery. The producers financed the remaining construction of the restaurant and the cable car and gave them back to the Schilthorn Company after the shooting was completed. The exhibit has interactive games, entertaining role-playing, and even a simulated helicopter ride that included seven film scenes that take place around the summit. Birg platform – the SKYLINE THRILL. We took another cable car to Birg, an intermediate station, where in the summer of 2014, the Schilthorn Company unveiled its Skyline Walk, rightfully called “the Skyline Thrill.” Standing on a viewing platform offering an unobstructed view of the majestic ragged Alps and equipped with a see-through floor that hangs over the dizzying void below, I felt like I was walking on air. Gimmelwald: Where the Swiss fairy-tale past comes live . We boarded a cable car once again, went back to Murren, only to change into another cable car that took us to the station called “Gimmelwald.” We exited the station and found ourselves in a quaint charming village with a cow trough in front of every house. 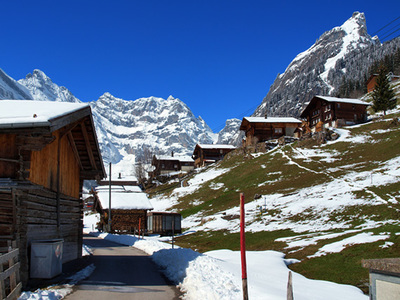 Once, Gimmelwald was one of the poorest places in the country. The villagers gathered hay and survived on government subsidies and a few visitors. Even today, most of the 120 residents resist modernization, citing an “avalanche-zone” building code that prohibited modern development. Unlike big cities and other resorts, they have no use for a frantic lifestyle and fierce competition for tourists’ francs. There are a couple of guest houses and the locals have set up several small barns with refrigerators filled with fresh milk, cheese, and other local foods. A price sheet is on the door and a cashbox is next to it. Pick what you like, pay what you owe, and go on your way. The village of Gimmelwald exists in a timeless world that seems centuries removed from Geneva or Zurich. 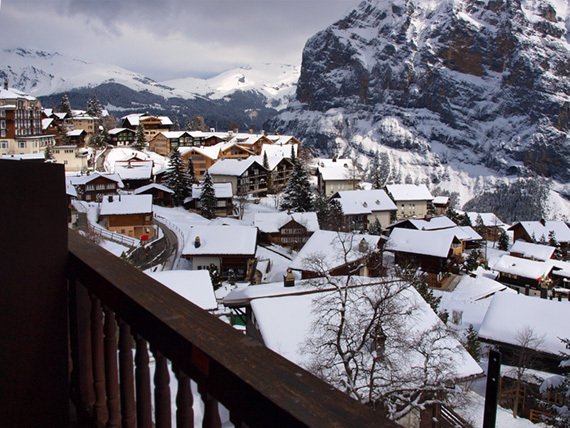 We returned to Murren to enjoy the panoramic view from our welcoming hotel’s terrace. The next morning we caught a train from Bring and continued our exploration of beautiful Switzerland.